COMMENTS: These are the right size for me. COMMENTS: These worked out great! COMMENTS: I use this product for my soy melt cube, it work excellent. • size, easy to fill. COMMENTS: The trays are fine. I just got wax all over the edges--will take practice. COMMENTS: Absolutely love the size of this product. Started out making sample size bath bombs and moved on to making my own scented melts for my wax warmers. Multi functional product. Will definitely be buying mare to give wax melts as gifts. "Great for Soy Wax Tarts"
COMMENTS: This is my favorite container for wax melts. Customers can break off the amount they want to use. The design is classy and a bit different than the usual cube clam shells. COMMENTS: The perfect look/shape for my lotion bars. Just a little deeper than I thought they would be...but still do the trick. COMMENTS: This container makes is very handy for making uniform bars of soap. The package keeps it's shape when the hot liquid soap is poured into it. Doesn't take long for the soap in the package to cool. Easy stacking for multiple rows of product. COMMENTS: I use these for my wax melts and also mp samples for customers. Absolutely love them for the convenience. COMMENTS: These are just right for our product, worked out perfect. COMMENTS: I have been using these for years! 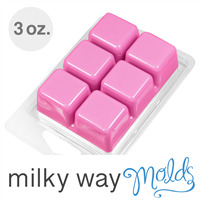 Makes a cute soap or wax tart mold. COMMENTS: Worked perfectly for tarts. COMMENTS: Excellent for making soy tarts. Easy to use and easy to break apart as well. COMMENTS: I bought these but then realized 2oz is not much wax and you have to use several melts to put in a warmer. Plus they are more expensive than the ones that hold 3oz of wax. They were sturdy and all and labeled easily but just too small for what I personally wanted. COMMENTS: I enjoy the convenience of these, but the soap can be difficult to unmold. COMMENTS: These are perfect and so easy to use! I pour at around 200 degrees and haven't had one warp yet. They show off the colors of the wax and look so classy with my labels. Love these. COMMENTS: My soy melts look so professional using these! I love them! COMMENTS: I bought a set of 12 just to see what I could use them for (when they were on sale). I have reordered twice! I originally used these to package single use travel soaps (6 per pack, obviously), but I tried them on my soy wax tarts and LOVE THEM! After pouring wax in molds, unmolding and then finding a way to package them, I was overjoyed to see how easy my tarts are to make with this container! I use Avery #22807 round white labels which fit perfectly on the flat piece and still allow the product to show. I especially like the seperate top and bottom pieces: easier to pour and store. COMMENTS: I love these clamshells! I use them to make samples of my M&P soaps. Customers can see the design, smell the scent of the soap, and even get a little block of it to test the feel. My samples last a lot longer in these containers. And when I pour my soap into these breakaways they look SOOO adorable!!! Very glad I decided to use these. "Love the 2 pc. set"
COMMENTS: Use these for soy melties & they hold up great. Customers seem to like the 2 pc set & it's easier to get to lay flat when pouring. My labels fit perfectly on the lid. Like much better than the one piece ones. COMMENTS: These are superb! Time Saver, I can't say enough about them! It would be great to have the 4 pack Votive Clamshell's made the same way, in a two piece clamshell!! COMMENTS: If you haven't tried these yet your missing out! Just AWESOME!!! Really great product. Please keep these! "Awesome!!! Best clamshell I've tried!" COMMENTS: The Crafters Choice clamshell for wax potpourri is by far the best container for these I've ever used (and I've tried several). They withstand a higher temp so no warping, and have a better size for labeling, and are easy to open and close. And very classy-looking. Hope these are back in stock soon, I need MORE!!!!! COMMENTS: These are perfect! Another great item from WSP. COMMENTS: These are the best thing since sliced bread! Sure makes your packageing look high end. I love the face of the space saver with these! You won't go wrong getting these. You will not be sorry! COMMENTS: I have had soooo many requests for tarts, but never wanted to take the time to pour, pop out and package. These make tarts soooooo SUPER EASY!! Have wax left over after topping of candles, but not enough to make anything with?? Make a tart or 2! Let cool, pop on the back, slap on a label and TA-DA!! You are done! Will be buying more of these I'm sure! "How to make a good label for these"
COMMENTS: These are great to use. I used them for the 1st time and was amazed on how easy and how professional the break away tarts looked afterwards. ***Helpful Hint*** If you are making your own labels, Avery 8163 labels work great. Just use your graphics program and set it so your text or pictures are not to the edge. After you make your label, cut off the left and right rounded edges so that the label is completely square. This label will now fit perfectly on the back of your break away tart holder. COMMENTS: These are so easy to use! They make tart making for craft shows so fast and easy. Once made, they take up less space than bags of tarts. Superb! COMMENTS: Making tarts has never been easier! My customers love them! COMMENTS: Love them!! 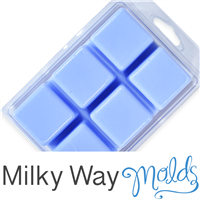 This clamshell makes pouring and packaging of wax melts soooooooo much easier!! Thanks for making them available!! COMMENTS: I love these so much, I may never make the more traditional tarts again. I can fill 8 of them with one pound of EcoSoya PB. Once they're cool, I print out my labels and put them inside the container - between the tart and the lid - and the labels stay nice. They also hold up well to customers opening and closing them over and over again. Just a great product! COMMENTS: ...can't wait to order more! "Can these be used for sugar scrub cubes"
"This part is confusing.. please help $0.95 for 1 Set $29.95 for 50 Set $250.95 for 500 Piece (10 - 50 piece) I assume with the 95 cent we just get 1 mold? and so on?or how molds in a set?" Staff Answer Yes, 1 set is one mold with one lid/back. "is this a total of 2 oz of wax total in the 6 tarts or each tart holds 2 oz?" Staff Answer This clamshell holds a total of approximately 2oz. "Can these be used for bath melt packaging?" Staff Answer Yes these Break- A - Way clamshells would be a perfect use for bath melts. "Could these be used for solid lotion bars? " Yes these could be used for solid lotion bars but please remember that these have a maximum pour temp of 180 degrees. Pouring at a higher temp can cause the clamshell to warp or melt.